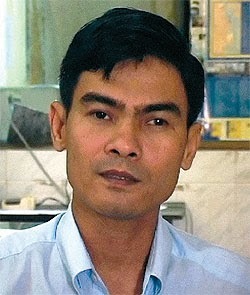 The Phnom Penh Post interviews Who Killed Chea Vichea? producer Rich Garella. This post has been updated to reflect the cancellation of the screening. See article below and the next day's followup. 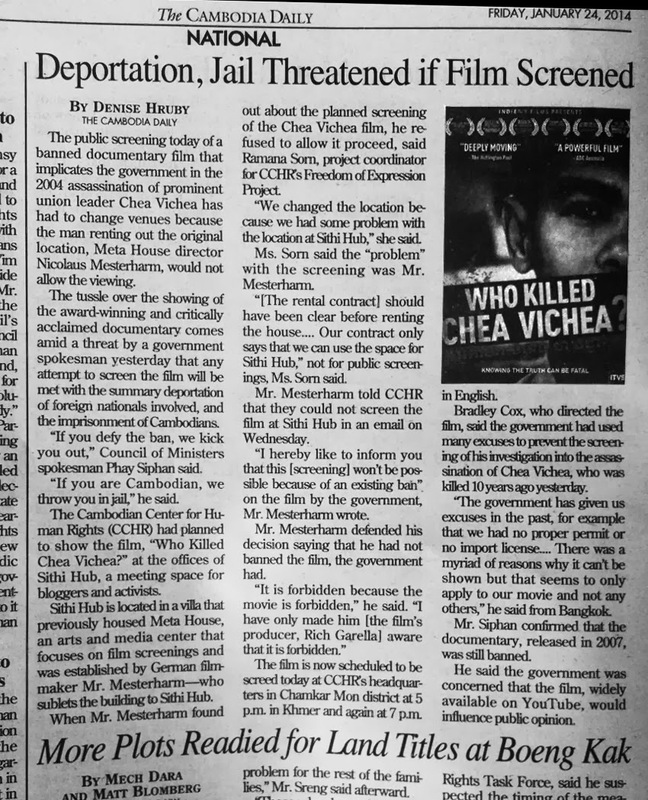 Due to statements made by Council of Ministers spokesman Phay Siphan (see “Deportation, Jail Threatened if Film Screened,” in today’s Cambodia Daily on page 16), those who planned to attend the screenings of Who Killed Chea Vichea? scheduled for this afternoon and evening should check the following web pages for updated information and please forward this to those you know who may be interested. We will also post updates on the film’s Facebook page. The screenings have been canceled. Loud Mouth Films respects the right of the host involved to make this decision in light of recent developments. Government spokesperson Phay Siphan is cited saying that the government is concerned that the film would influence public opinion. That is exactly the issue here. In a country that respects freedom of expression and freedom of assembly, the people are free to assemble, discuss as they please, and expose themselves to any kind of information and form their opinions freely based on that and on their own conscience. Cambodian officials have never to our knowledge provided any legal basis for a ban on Who Killed Chea Vichea? or any specific film. In stating that they ban a film without providing any legal basis, these officials demonstrate that Cambodians do not live under the rule of law, but under the rule of power. Two decades after the Paris Peace Accords, and a decade after the assassination of Chea Vichea, the rule of law exists only as a smokescreen. It vanishes whenever those in power find it convenient to blow it away. Meanwhile the killers of Chea Vichea and those who ordered the killing are still "at large." It is our intent to honor Chea Vichea and many others who struggle, and continue to struggle for basic human rights and a better and freer Cambodia. However the government is making the screening of this film into a test of its respect for freedom of expression, freedom of assembly and the rule of law. So far today it has failed that test, as it consistently fails, because its fundamental nature is to feel threatened by these freedoms. Rich Garella, Producer, Who Killed Chea Vichea? Note: The statements above are made by Rich Garella and Loud Mouth Films. No part of them should be attributed to any other individuals or organizations. The first official screenings of Who Killed Chea Vichea? in Phnom Penh in Khmer and in English, below, were canceled after the government threatened deportation of any foreign nationals and arrests of any Cambodian nationals involved. See later posting. The welcome would have been by Rong Chhun, President of the Cambodian Federation of Unions. others might have been announced.